1. Pre heat oven to 180C and coat the tin with some spray oil (I used a standard sized round cake tin). 2. Combine the flour, salt, baking powder and cinnamon in a bowl. 3. In a separate bowl combine the sugar, oil, butter, yoghurt, eggs and vinegar. 4. Mix the dry into the wet until you are left with a stiff batter (it will be pretty stiff – don’t worry!). 5. Fill your tin with the mixture and press out evenly. 6. Bake for 30 – 35 minutes until slightly golden. 7. Allow to cool and then store in the fridge, or slice and freeze individual slices. 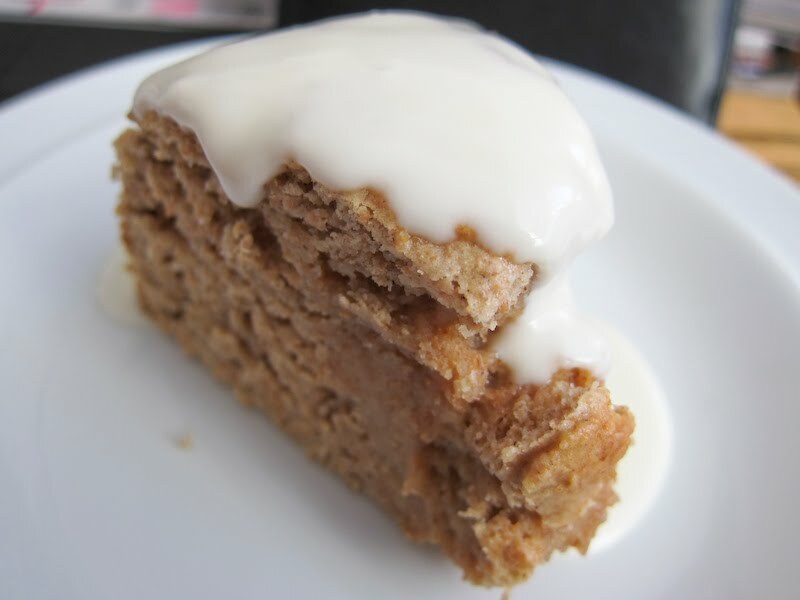 If serving as a whole cake, sprinkle with some sieved icing sugar for presentation – then serve with yoghurt, ice cream, custard or a sweet sauce made by mixing a teaspoon of apple cider vinegar, 1 tablespoon of agave syrup and 1 tablespoon of Greek yoghurt (this is how it is pictured above).